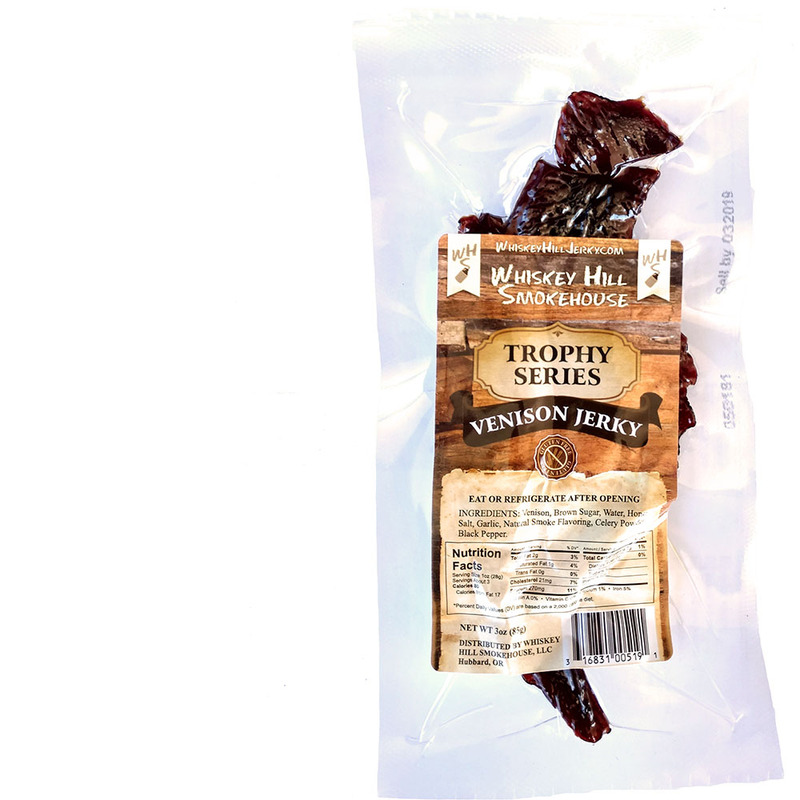 Whiskey Hill Smokehouse says this Venison Jerky has , "No wild taste", and goes on to describe the flavor as, "Just a hint of tang with a little Black Pepper", and says the meat comes from, "slices of premium, tender VENISON prime steak". The first flavor that hits the tongue is sweet, followed by a faint salt. The chewing brings on a touch of black pepper, and eventually introduces the natural flavor of venison. A light smokiness finally finishes off the flavor. For being a venison jerky, this does give off a noticeable venison flavor. It has that more rich, red meat character that venison is known for, and just like what Whiskey Hill Smokehouse says, it doesn't have the "wild taste". It's a milder venison flavor overall, not really the sharp, darker red meat flavor. Otherwise, the primary taste profile is a dominant sweet, along with a noticeable black pepper, against the natural venison meat flavor. The garlic and smoke flavoring remains light in the background. The meat consistency is excellent. It's a bit tough initially, and will take some chewing effort to get through, but yet doesn't wear down the jaws that much. 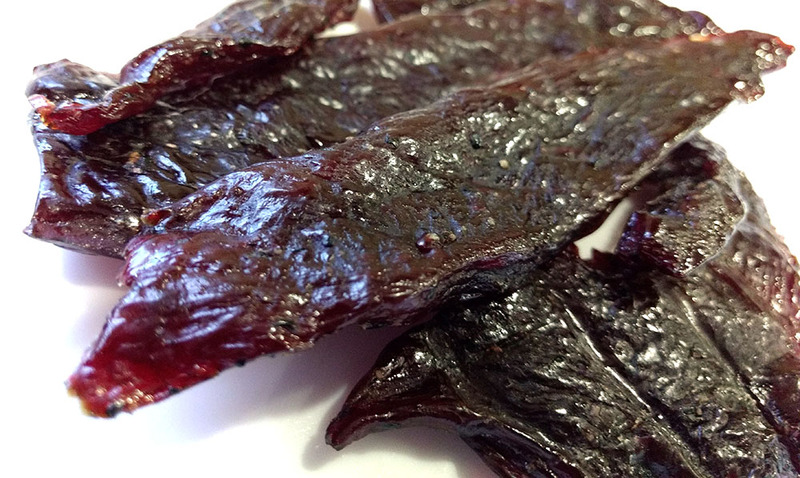 It's actually a dry jerky, though quite moist and sticky on the surface. Yet, these appear to be thick slices of pure venison meat, with no stringiness and nary any fat. This Venison Jerky from Whiskey Hill Smokehouse serves up the unmistakable flavor of venison, with a clearly defined rich, red meat character that deer is known for. It's not gamey at all, yet offers a natural meat flavor distinguished from beef and other red meat animals. The company does a great job of minimizing the seasonings to help the venison meat flavors rise to the top, yet still offers just enough sweet, garlic, and black pepper to keep this savory and snackable. 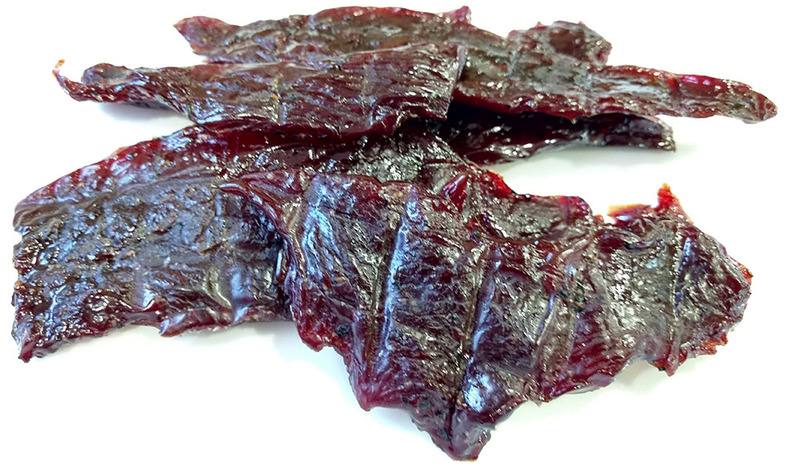 Otherwise, this jerky tends to be tough, requiring you to get good grasp just to pull apart. And because the surface of these pieces are moist and sticky, that good grasp results in some messy fingers. For that matter, this jerky is better suited pre-sliced into bite sized pieces. On top of that, despite the brand having the word, "Smokehouse" in the name, the smoke flavor doesn't taste real wood smoked. Regardless, the flavor of venison is well represented here, and will certainly convert many deer meat newbies into repeat snackers.